Report by guest baker Yo Utano. 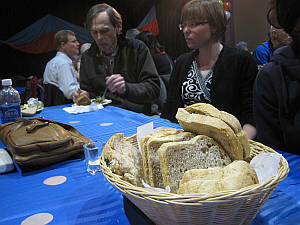 Beat the Winter Blues is a fundraiser banquet that the Davenport Perth Neighbourhood Centre (DPNC) hosts annually. 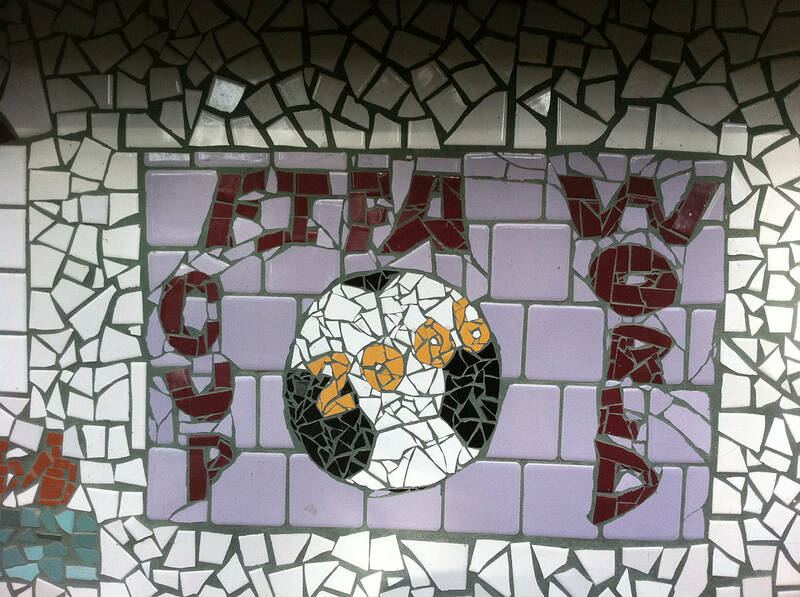 Last year, the money went to Haiti after the earthquake, the year before to a community member who had lost their home in a fire. This year, it was for the Davenport West Bike Project that promoted bicycles as a healthy mode of transportation. 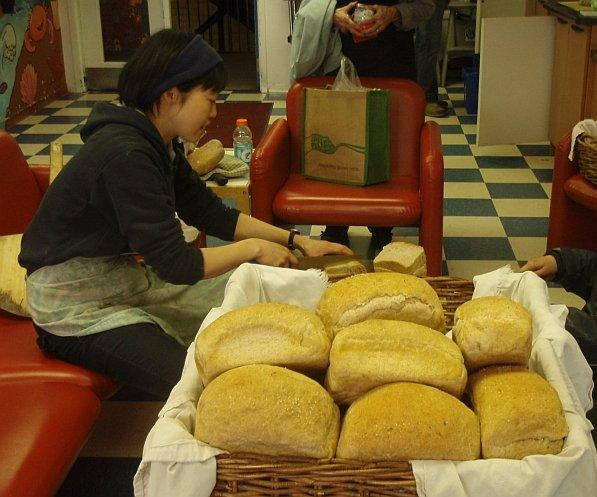 I felt good when we were told that we could make as much bread as we wanted. There is no such thing as “too much food” here. Gabrielle, the Bike Project coordinator, was confident that most food would get eaten, and whatever was left could be stored in the freezer for future use. That is a good sign, there are enough resources to take care of the food and the people who eat it, including leftovers. 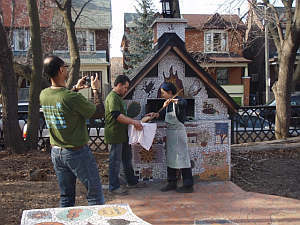 The counter mosaic with the DPNC behind it. Mayssan and I came to preheat the oven on Thursday afternoon. 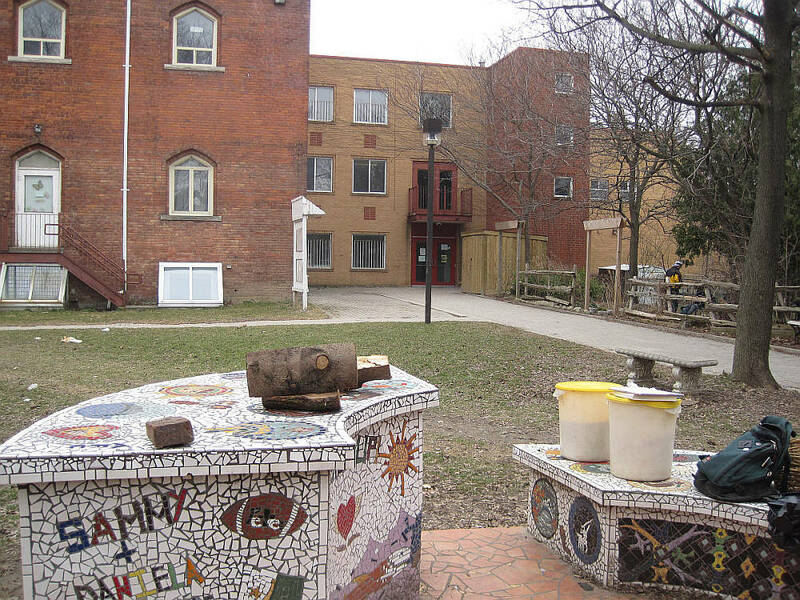 We borrowed the tools at the Stop Community Food Centre next door who ran the pizza day program in the summer. The kitchen was just starting to calm down after their busy community lunch, so Scott, the kitchen coordinator, came out with us to check the oven. 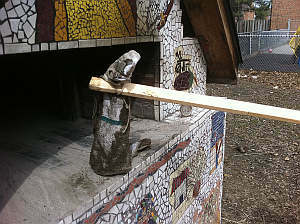 The oven looked desolate then with its door broken, but during the summer, it would produce hundreds of pizzas every week. Scott told us how popular it was, a number of pizzas were lined up on the counter, people waiting for theirs to come out. So the fire was lit. Marcelo, a Bike Project volunteer came to chat with us. 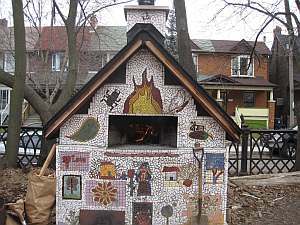 He talked of the underground cooking of meat in Brazil where he was from, and of an oven in his garage just a couple of blocks away in Toronto. It belongs to his landlord who is also Brazilian, and they would cook with it until the city came one day to tell them they were not allowed to use wood fired oven in the garage. “So there's some wood that's left since that time” says Marcelo. Forming loaves in the kitchen. The oven had barely burned white when I left at 4:30. I was conserving wood, but found this oven heated up fast too. 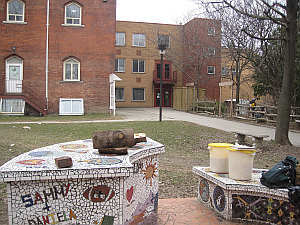 I wondered if such a fast-heating oven would not keep its heat, which is what happened at Christie and Scadding Court. 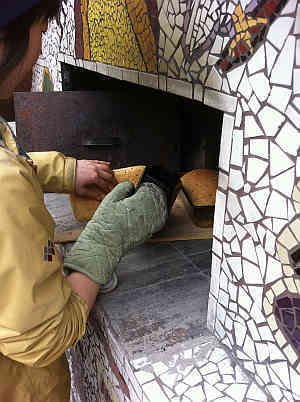 The next day I would get to try, although the case with one oven doesn't necessarily apply to others. 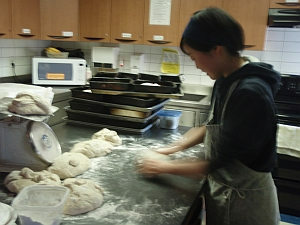 Friday morning, I made a batch of each Rosemary Bread and Multigrain Bread dough, both from Dufferin Grove bread recipes. The only difference was that I made it with all-purpose flour instead of hard flour. I also made a small batch of light rye sourdough. I like rye very much, it's so flavourful and the plant is very hardy but the demand is not so big here. I want it to gain more popularity. Mosaic on the oven and counters. We arrived at the oven to find a pile of wood in front of the oven. Marcelo had brought it from home. It's such a great gift, as sourcing wood is not easy and expensive. Cooking with fire reveals how complicated it is to live in the city, I'm sure Marcelo's landlord felt the same. 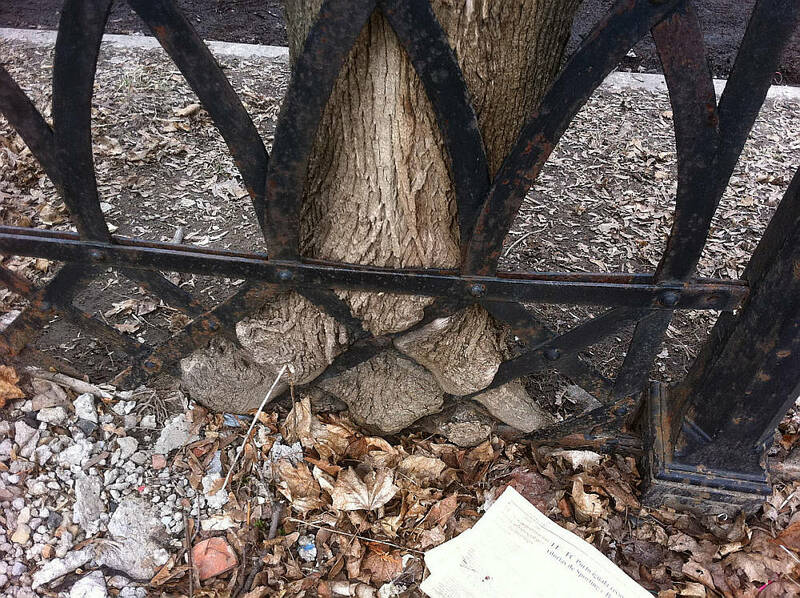 There is no forest to collect firewood from, just regulations that get in the way. 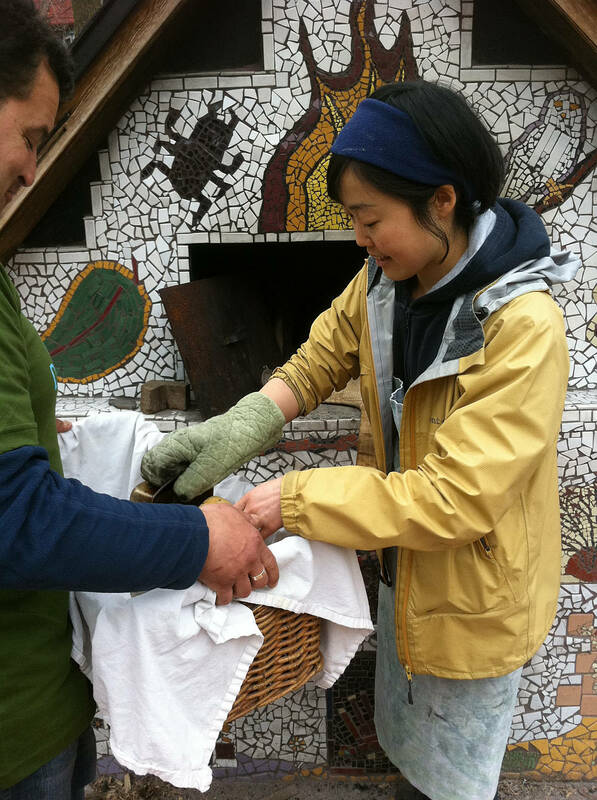 I sat on the bench with buckets of dough rising slowly in the chilly wind. A time to contemplate the day and observe the place. This oven is very pretty. 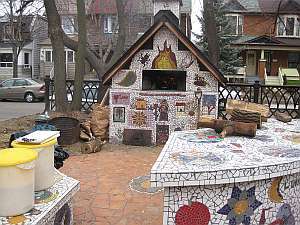 There is mosaic art all over it, colourful fire, beetles, houses and leaves on a white background. The bench I was sitting on and a counter beside it also have mosaic. It is in the backyard of DPNC, and people who use the centre walk right by there. An elderly Brazilian couple stopped for a while, telling me about the husband's father who ran a bakery with a commercial wood-fired oven in Brazil. The bakery doesn't exist anymore. A Chinese family came to peek in too, the father was very curious about the bread and he came back later when the bread came out. A woman in flip flops gave me a monologue-like speech about her lunch and left. At 1pm the kitchen was available, so I went in to form dough. Inside, the building was starting to get busy for the event. People in Bike Project T-shirts were running up and down the stairs to set up, volunteers making cupcakes and salads. Yo with the rosemary bread. At 3:30 the first load of bread went in. The temperature was at 450 F, not so hot for the first load, even though it had been burned completely white (the bricks turn white when they are hot, which is how you can tell they have absorbed the heat). Jutta came by to check in and see how things were going. She and I talked about how the heat would get sucked in deeper every time the oven was fired and would be stored in the structure. The heat layer accumulates, and when used while the structure still holds the residual heat, it is much easier to heat up and keep its heat. That is why brick ovens increase efficiency when used on a regular basis. Still, it could bake two loads of bread. This type of yeasted bread baked at an appropriate temperature is so fluffy, almost like a dessert. As much as I love dense, whole grain sourdough bread that requires a lot of chewing, I was happy to see the bouncy crumb and people enjoying it. I even enjoyed slicing the tall loaves for the banquet. Baking in public comes with unexpected encounters. Every time, it's an adventure. While the DPNC users are diverse, many of them struggle with mental health issues, addiction, or poverty. There is little I can do to support them directly, but the oven at least gives me a chance and a conversation piece to talk to people with whom I don't necessarily have contact otherwise. Improvised mop to clean the hearth. Testing the loaves for doneness.